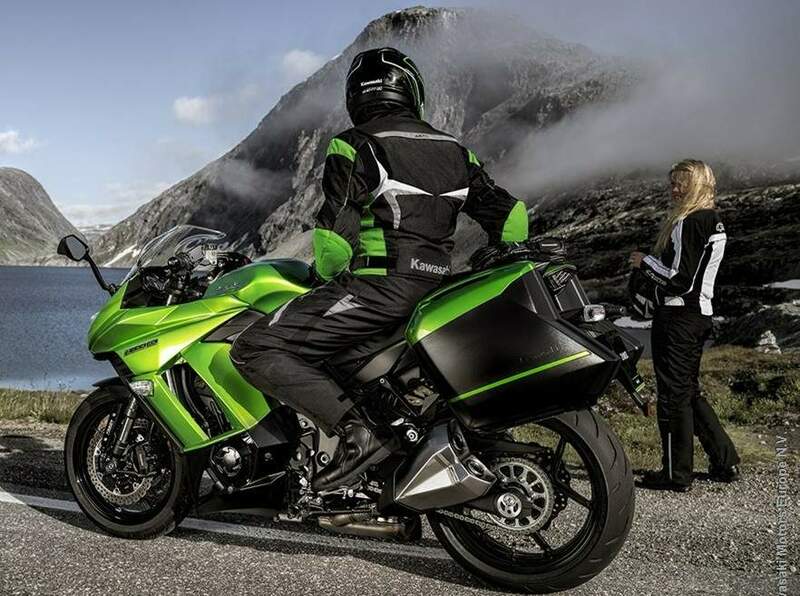 Kawasaki have “further refined” the Z1000SX sports-tourer, with new colour-coded panniers (each of which can hold a full-face helmet) that can be locked and unlocked with the same key that’s used to operate the ignition. Apart from the panniers, the Z1000SX also gets 3-mode KTRC traction control system, two rider selectable power modes, revised 41mm front fork, remote adjustable rear shock and updated brakes with a radial-mount master cylinder. 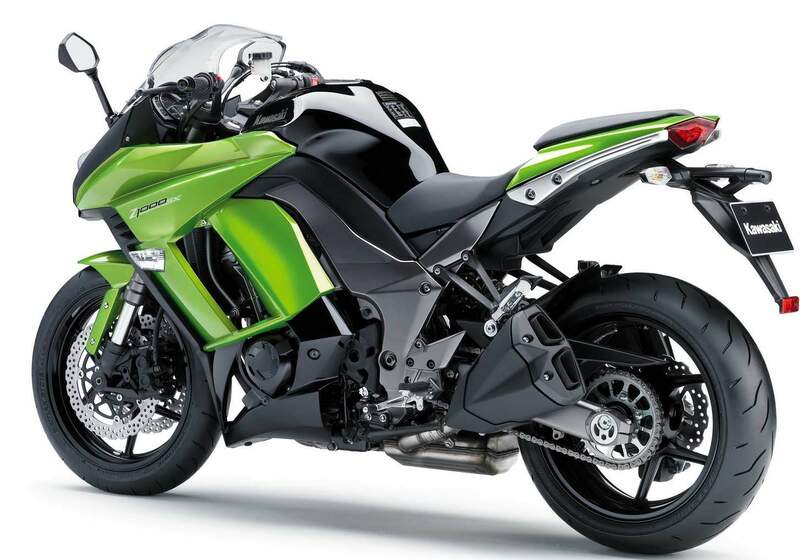 The Z1000SX has a revised air box and air intake system, which Kawasaki claim results in a louder howl while accelerating. 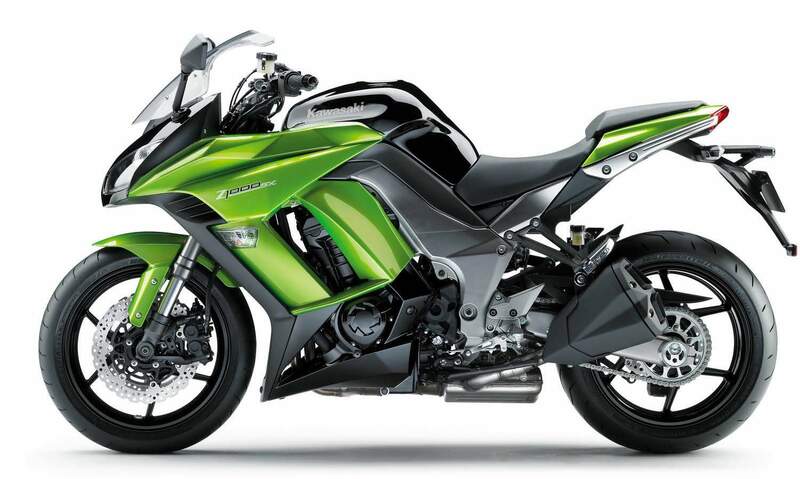 “With such a wide appeal, the Z1000SX has already gained many fans from both supersports and touring backgrounds. With so many additional features for the coming season, we are sure it will retain its commanding position in the sports/touring market,” says Yasushi Kawakami, Managing Director of Kawasaki Motors Europe. Winsford 30 miles' reads the blue motorway sign as it flashes by, and it catches me out on two fronts. Firstly, it means 145 miles have slipped past since I set out from Colchester just over two hours ago and secondly, with 2 bars still showing in the fuel gauge it means that I'll make it all the way to Oulton Park racing circuit on a single tank (around 19 litres) of fuel, giving a fuel economy of more than 45mpg. I've now ridden more than 3,800 miles on my long term Z1000SX; I already liked it a lot, but long trips like this one make it grow on me even more. Buying a big sports-tourer takes a level of commitment quite a bit higher than other types of bike. With supersports machines for example, compromise is the name of the game when it comes to buying. Having a machine that will give razorsharp handling, stop on a tuppence and be as light as a feather demands compromises in the comfort stakes, and buyers are perfectly accepting of those compromises. When you're choosing a bike to do big miles on, you're still after a good degree of those sporting characteristics but combined with decent wind protection, a comfy seat and riding position and a good tank range. The pillion seat needs to be bigger (and thicker) than a postage stamp, and carrying luggage should be a stress-free affair. The Z1000SX Tourer has already proven itself as a very capable bike in all the 'must have' areas buyers will demand from a big sports-tourer, but now that I've spent some serious time in the saddle, it's time to reflect on what 'else' potential owners can expect beyond the motorway mile-gobbling capability. First up, tyres and handling. Always related - especially so on big bikes - the handling of the SX is particularly sensitive to tyre pressures. With as little as 2psi variance from the manufacturers recommended pressures the normally sweet steering becomes heavy and the bike is more reluctant to turn into slower corners. Properly inflated, the problem disappears and the big Z1000 SX becomes nimble and balanced once again. This sensitivity to tyre pressures has turned out to be no bad thing in the end. Knowing that I need to check them weekly has meant that I also lube the chain regularly, something that would be all to easy to forget as the miles rack up so quickly and effortlessly. The OE Bridgestone tyres give plenty of grip in both wet and dry conditions and they've lasted remarkably well. Almost 4,000 miles up on the original set and there's probably another 1,500 to 2,000 left in them before they'll need changing. As I've already mentioned, fuel economy is pretty good on the Z1000SX Tourer. I've averaged 48mpg over the best part of 4,000 miles. Riding solo or fully loaded with pillion and panniers makes only marginal difference to both handling and fuel economy. 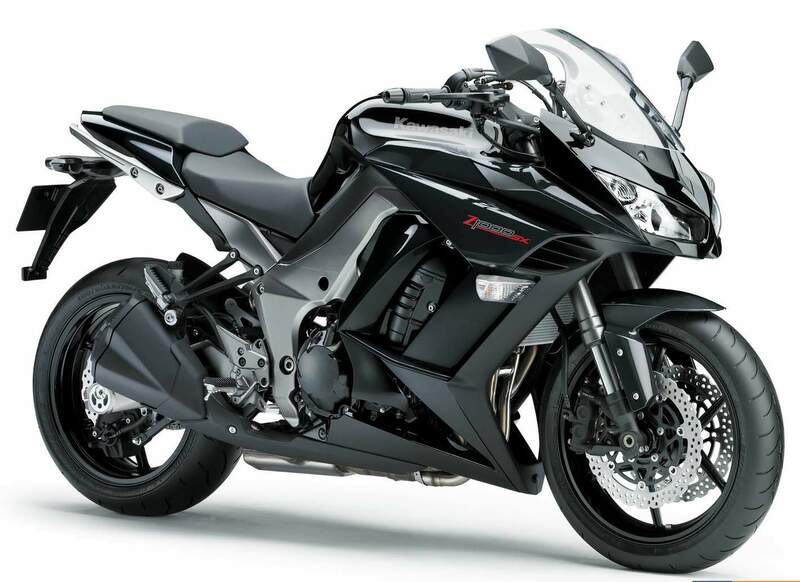 So, the Z1000SX certainly ticks all the 'captain sensible' criteria needed to justify the serious business of choosing it as your 'do it all' sports- tourer bike. Its very easy to be seduced by the cruising comfort and be lulled into riding everywhere just below or above the national speed limit and think that's all there is to it. But get the engine spinning past the torque wave and into the power and the SX suddenly becomes a different beast altogether. From 7000rpm it's as if the bike snaps out of 'tourer' mode and snicks into 'sports' mode. The drive from the engine becomes much more urgent, and even Porsche drivers will need to be in exactly the right gear to have a chance of staying with this suddenly transformed bike. This is the point in the rev range when the nose starts lifting of its own accord in both and second gear. Hit 7k rpm in third or fourth gear and the rush of forward drive will overwhelm almost anything else on the road. The power surge doesn't subside until right at the top of the rev range. This isn't the time for panniers or pillions, this is where the smile creeps in as the engine lets you know that it is built for more than mere touring, the Z1000SX Tourer has got heart and spirit in abundance. But I guess it shouldn't come as surprise that Kawasaki have got the sports-tourer package so 'right' in the new Z1000SX Tourer. They've been refining the Z1000 for over 30 years.